I’ve been talking about the importance of making your website mobile friendly for years, and now it’s becoming more important than ever. That’s because as of 2018, Google has started rolling out their “mobile-first index” and this will put Google’s priority on mobile content. There are still quite a few websites out there that are NOT mobile friendly (or responsive), and others that have used an old way to present mobile by basically having two versions of the website. Why is Google Moving to Mobile First? Probably the biggest reason is because mobile searches now far exceed searching from desktops. Practically everyone has a smart phone these days, and when you combine that with tablets, desktops are slowly becoming a smaller group. As you can see, even IF there is a desktop computer available, people use their mobile devices as a preference for searching. According to Google, if your website is NOT mobile friendly, it will still crawl your desktop version just as it normally would have. However, where it could possibly hurt is your ranking in search results (for mobile users). Since over 60% of searches come from that group, it could impact your website traffic coming from organic search. If you have a Responsive Website design, then you don’t have anything to worry about (for now at least), because Google considers it be mobile friendly. 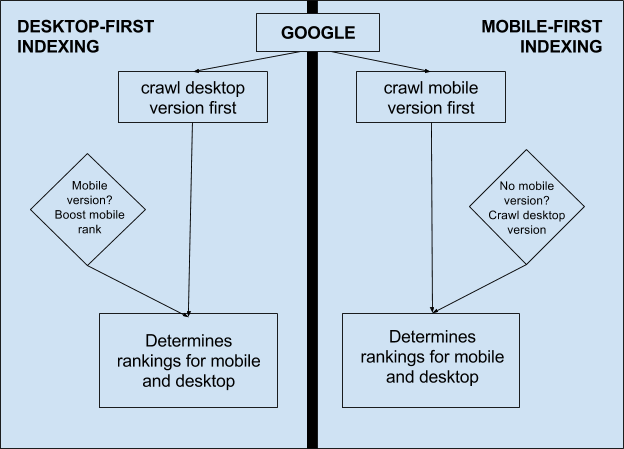 In the MOZ article “How Does Mobile First Indexing Work,” they discuss this in more detail. How Do I know My Website is Mobile Friendly? If you have an older website, maybe from 2013 or older, chances are it is not responsive. There’s an easy way to check, by going to Google’s Mobile Friendly testing page: https://search.google.com/test/mobile-friendly. Google will load our website and then make some assessments for your website’s “mobile friendliness.” If it comes back with negative results, you should strongly consider doing something about it. Contact us today to find out how plumThumb can help your website be more mobile friendly.